Breakdowns in communication can cause a project itself to breakdown. Miscommunication often results from disconnected software systems that don't talk to each other. Data breakdowns and loss of key elements during software transfers can cause work to be done according to outdated plans, delays in data sharing, and costly rework. Disconnected teams stretch timelines, increase risk, and drive up cost. But how do you keep teams connected? To ensure your construction project is completed on time, on budget, and to proactively manage risk, you need to have the right tools and processes in place. Project teams need clear project workflows that are easy to use every day and simple enough to be shared among all stakeholders. Pype AutoSpecs, eSUB, and SmartBid are all reliable, accurate solutions that integrate with Autodesk BIM 360, and the streamlined workflow is making the industry more productive, efficient, and profitable. 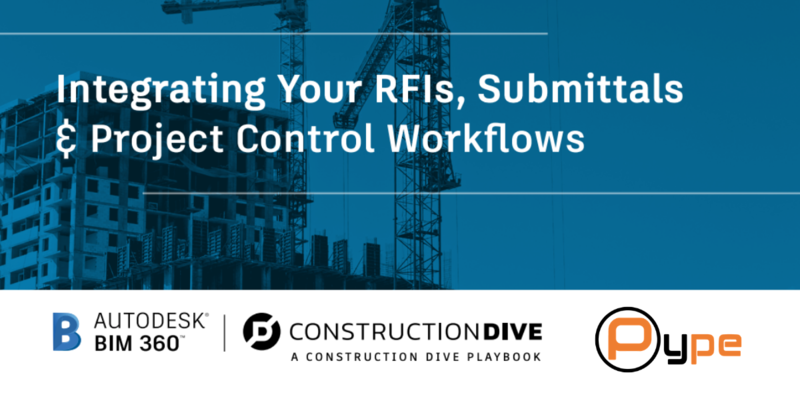 Read more about Integrating Your RFIs, Submittals & Project Control Workflows, a Construction Dive playbook created for Autodesk.